Sweet and chewy popcorn balls make up this adorable Popcorn Snowman, perfect for holiday parties! This recipe yields one large snowman, or you can make multiple smaller snowmen. Place three strips of waxed paper on a table or kitchen counter, and spray them with nonstick cooking spray. Place the popped popcorn in a large bowl and set aside. In a medium saucepan, combine the sugar, corn syrup, and water over medium-high heat. Then insert a candy thermometer. Cook the candy until it reaches 240 F.
Pour the sugar syrup over the popcorn in the bowl and stir gently until the popcorn is evenly coated. Spoon three mounds of popcorn on the three strips of waxed paper. You want to make the mounds in three different sizes to represent the small head, medium torso, and large body of the snowman. Allow the popcorn to cool for seven to eight minutes. When it is cool enough to touch but still warm, spray your hands with nonstick cooking spray and form the mounds into balls, stacking them on top of one another in a snowman shape. Be sure to press the balls firmly so that they don’t fall apart. Press the raisins and any other candy into the snowman to form eyes, a nose, a mouth, and buttons. 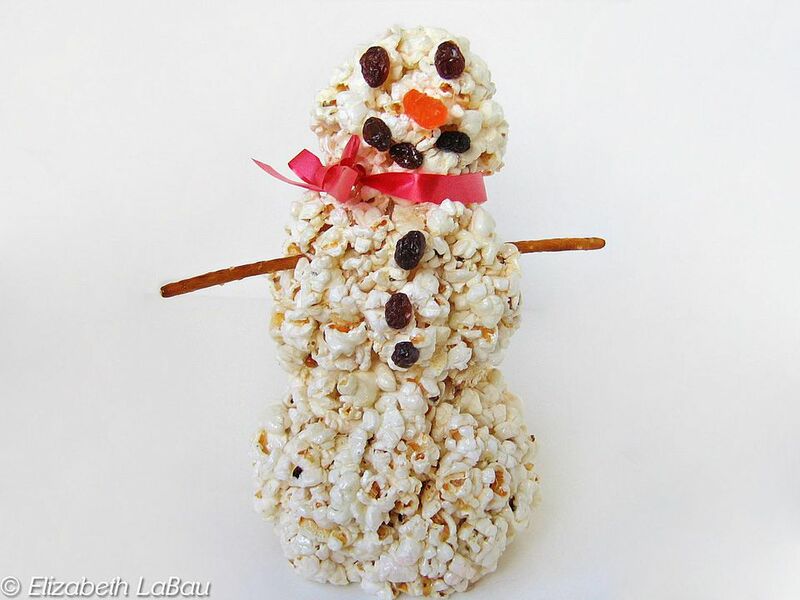 Insert a pretzel stick into each side of the middle popcorn ball for the snowman's arms. If desired, tie a ribbon around the neck of the snowman to complete his look.